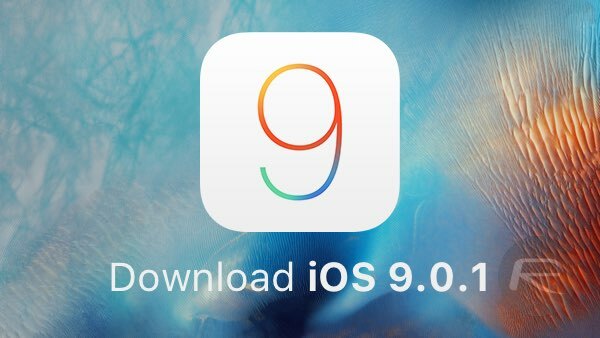 Only a week after iOS 9.0, Apple today has released final iOS 9.0.1 IPSW download links for supported iPhone, iPad and iPod touch devices. So, just what does iOS 9.0.1 offer to all of those opting to download it? First and foremost, the release introduces a fix for a bug that a large amount of users had been experiencing with the iOS setup assistant after upgrading to iOS 9. The aforementioned bug causes a fair bit of frustration by getting users stuck in a position where they could never actually successfully complete the setup process, instead getting stuck on a “Slide to Upgrade” screen. Apple’s interim fix for this issue was to restore via iTunes from a backup. 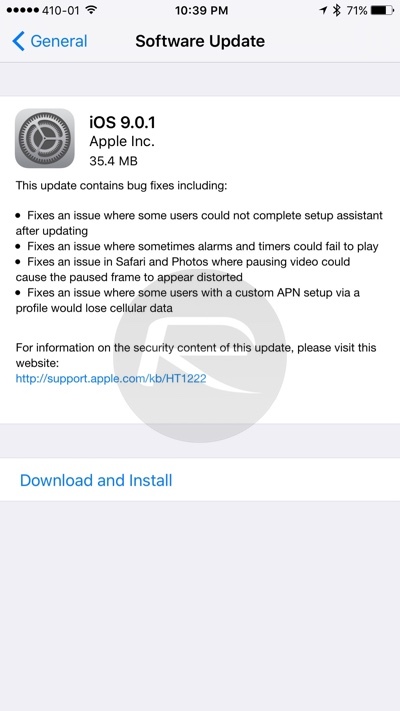 iOS 9.0.1 also brings with it a number of other bug fixes for issues that have been reported to Apple. An issue whereby alarms and timers could fail to execute has been addressed and resolved. There’s also a visual fix for Mobile Safari and the Photos app that addresses an issue that users were experiencing when pausing a video. Pausing a playing video would occasionally appear to show the paused frame as being distorted. This has now been rectified. The final issue that’s been addressed as part of the official change log that accompanies the iOS 9.0.1 update pertains to a custom VPN setup. Specific users who were opting to use a custom VPN setup via a profile were experiencing issues with the loss of mobile data. The latest version of iOS addresses and fixes that issue for all of those who had been experiencing it. As always, the latest version of iOS is available as an over-the-air download via the Software Update mechanism in the native Settings app (Settings -> General -> Software Update). Alternatively, if you want to clean install, you can do so using iTunes and the firmware file tailored for your iOS device, which you can grab from here. Could you post the links for iPhone 6S and 6S Plus please? There’s no way software has no bugs, bro. Your day job doesn’t involve designing rockets, does it. I wanna see you type his native language, perfectly. Cause if you can’t then you have no business to get other others for how they type in English. This is an English forum… My knowledge of his language is irrelevant. APN. VPN is a different thing entirely. Which 9.x release has wifi calling enabled? There are beta 9 users with it, but I’m not seeing squat on the final release. Btw, they really F’ed up the APN. Every MVNO cell customer was disconnected when the user updated to 9.
for iphone 5s, the GSM and CDMA are switched. So, if you are a GSM user, then download the CMDA one. Software bugs are always present, minuscule or not. After upgrading from 9.0 to 9.0.1 through itunes now every call I make the other personcant hear me and all I hear are weird robotic sounds!! for my ipad mini 2 model A1490, i downloaded iPad5,4_9.0.1_13A404_Restore, but itune says it is not compatible. pls advise. I am using purevpn with ios9 on my iPad and iPhone 6 and it’s working fine. Thank GOD! One worry less with ios 9. Phewww! Same for me. Any solution yet?